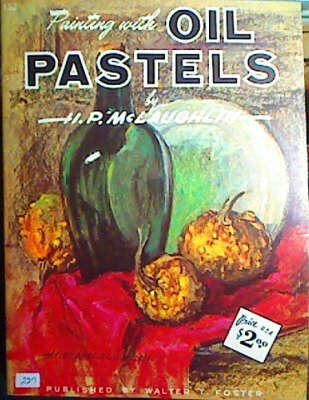 Walter Foster 152, How to Paint in Oil Pastels by H. P. McLaughlin is typical for its format. Either you love these or they bug you. If you've never seen this series an art store, a bookstore, a craft store or a used bookstore, you haven't been shopping in any of these places. These popular art instruction books began in the 1940s or 50s when illustrator Walter Foster decided to make art instruction inexpensive and created an unusual format. He used heavy, high quality all-rag paper and saddle stapled very large books with few pages, the usual size is 10 1/4" x 13 1/2". They may not fit very well on shelves but the format is concise, emphasizing images and demonstrations over text. After his initial volumes were such a great success, Foster began contacting other artists to write them and soon the series developed into a longstanding tradition -- always with the same concise writing and high quality four color reproduction on good rag paper. They were ludicrously cheap when they were new. This one, Walter Foster 152, was $2.00 for all those good pages. H. P. McLaughlin is an accomplished oil pastelist. He fell into the Foster format as if born to it, breaking down a wide variety of different subjects into stages and step by step projects with very little text. There is a bit more than in the Wildlife Painting volume since this is an introduction to the medium. You can still learn the most from the images in this book. Much more is demonstrated than explained. Every painting was intended to be copied by generations of students. McLaughlin has authored at least one more of these besides Walter Foster 152, a volume on wildlife painting in oil pastels, oils and acrylics. 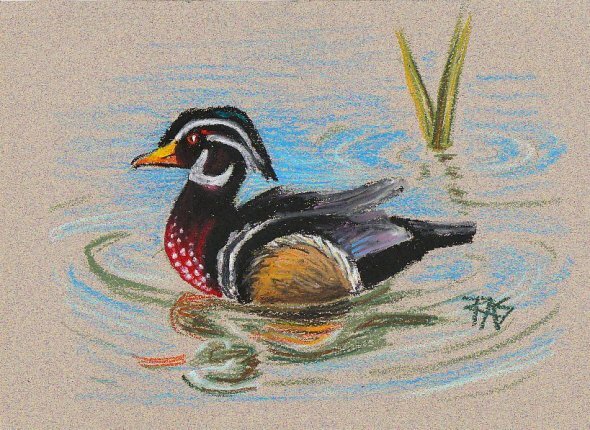 I had fun doing the above sketch of a colorful duck from pages 24-25 the day after I wrote this review. I used CrayPas Expressionists on Moonstone color Canson Mi-Tientes and again was struck by how much more was shown than said in the text. It's relaxing to just follow a step by step demonstration and wind up with a good drawing for my sketch wall, even if it's not entirely original. I added the reeds and changed the paper color just as the author suggests for any of these exercises. Many make beautiful decorative elements for your studio or room. Once again McLaughlin mentions not to be too concerned with matching the colors he uses in the book, as long as the near lookalikes you choose look well together. He goes into different surfaces you can use with oil pastels and the effects of white or toned surfaces with them. 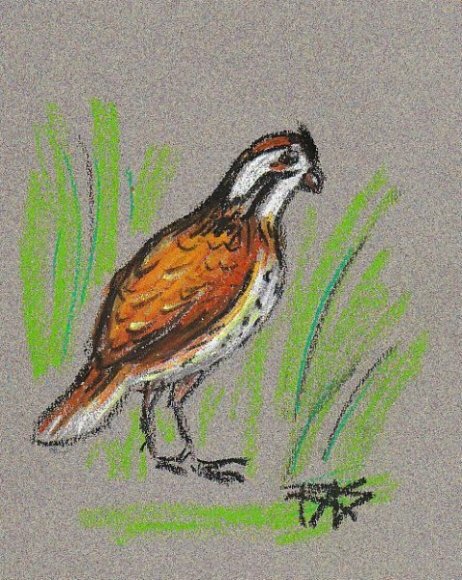 I chose to draw the demonstration for toned surfaces first, a quail, using Holbein Academic oil pastels on gray Canson Mi-Tientes on the smooth side. The original is about 8" x 10" but I cropped a bit in toward the drawing. It's not too far off from McLaughlin's loose style.